Saturday - you are finally here. Oh how I've been waiting for you! Here in Texas we have broken the heat streak and it is actually raining. So on this rainy Saturday I thought I would share a bit of bright sunshine with you. This image is (of course) from Lori Boyd. I paper pieced her dress and then colored her in with Copic markers. 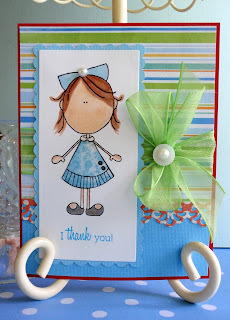 I used the Spellbinders Long Rectangle and Long Scalloped Rectangle dies to cut out the focal image. The border is cut the Faux Crochet Border die from MFT Stamps. I have had this one for a while, but this is my first time to use it. I have fallen in love (again) with my Bow-Easy. So you might be seeing more bows on my projects. This one was a snap to make. I will be back tomorrow with a fun card to share with you. I will give you a hint.....there is a caterpillar and a flower involved.